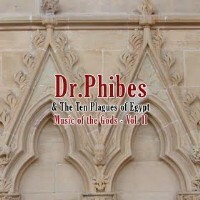 Dr. Phibes & The Ten Plagues of Egypt – Music of the Gods – Vol. II is the love child of two simingly opposite music styles – classical & heavy metal. It is a crazy and exhilarating mesh of heavy guitars along with classical strings, church organs and lots of noise. The second installment out of a two volume set features mixes of Beethoven’s Moonlight Sonata, and Sonata For Flute, Bassoon And Bass I/II/IV by Antonio Vivaldi, apart from Bach’s Fugue. Taking well-known classical as well as current movie soundtracks and converting them into something that every horror fan would love to have in their iPods; it is an excellent album that won’t give you any reason to hide under your bed. Citing influences like Vincent Price, Igor Stravinsky, Ennio Morricone, Jan Svankmajer, Brothers Quay, Camille Saint-Saëns, not to mention zombies and ZX Spectrum game music, Dr. Phibes certainly captures the imagination. The songs would fit snugly into the soundtrack of any updated version of classic horror films. Just like the movie, The Abominable Dr. Phibes, it is over the top and quite ambitious to take something already grand and mold it to become even better. Although the album doesn’t fail in its attempt, let’s just say there are a few “loose strings” in some bits. Overall, however, it accomplishes what it aims to do; to reach through you and send chills down your spine.